Hurry! 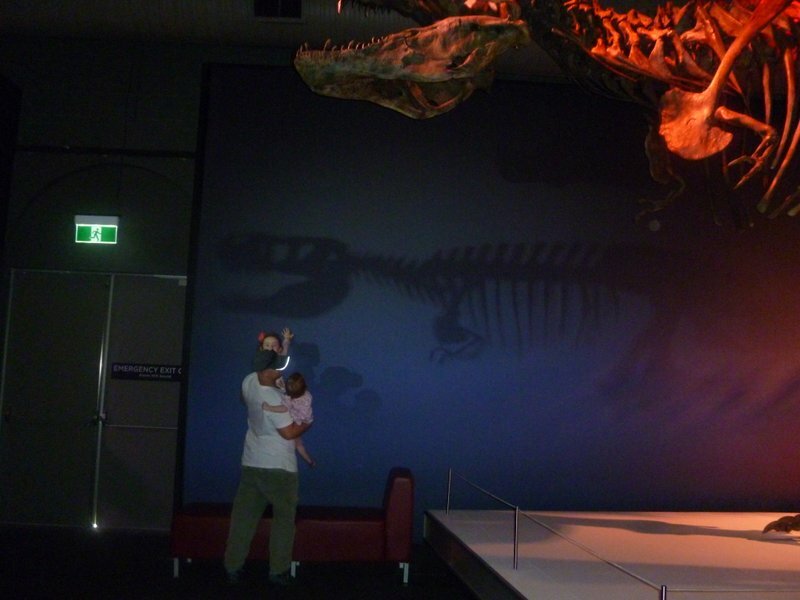 Only a few days to catch the dinosaurs at Newcastle Museum before they head elsewhere. Although ‘catch’ is probably not the appropriate word in this context. The tyrannosaurs* were ferocious meat-eating predators with powerful legs, heavy jaws, and very strong teeth. We humans wouldn’t have lasted at all long had we overlapped with the dinosaurs. Lucky for us, then, that they were wiped out by a giant meteorite in the Mesozoic Extinction Event 66 million years ago. 66 million years ago. Imagine that. I can’t. Such a huge number, the mind boggles. 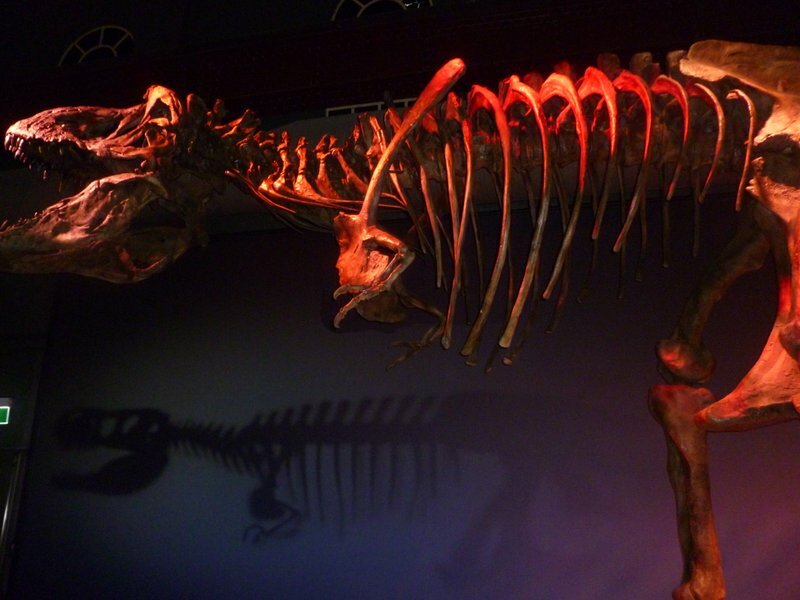 In fact, so much about dinosaurs defies comprehension, and the exhibition brilliantly showcases the wonders and mysteries of these primitive creatures. 10 life-sized specimens from the tyrannosaurs family were on display, including the king himself, Tyrannosaurus rex (Scotty), who measured an estimated 12 metres in length. Guanlong wucaii, early relative of T.rex, was also present. This feathered fiend has got dinosaur experts the world over oohing and aahing, as it confirms the link between tyrannosaurs and birds. Yup, people, T.rex was a bird in the making. Wow! I hear you say. You managed to gather all this information at the exhibition with your littlies in tow? And the answer is: Are you kidding?! I read the headers on the day and left the small print to late-evening Internet research. But I didn’t need the detail to enjoy the visit. And nor did the tots. The dinosaur specimens wowed us with their strange forms, giant size, long tails, and scary teeth. Especially T.rex, whose shadow had a mind of its own, and would reach down to grab unsuspecting visitors as they passed underneath. The interactive side of the exhibition was fun. 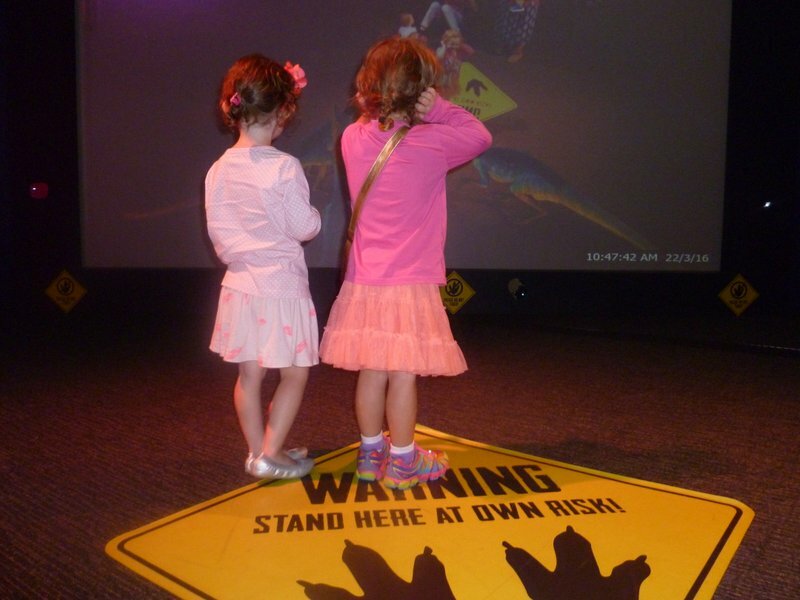 Ickle and Ettie particularly enjoyed being in their own dinosaur movie, although things did get a little loud at one point. And Bear tried very hard to jump up and down to power a meteorite large enough to wipe out the creatures we had come to see. We combined our visit with a play in the museum’s Mininova soft play area, morning tea on the lovely grassy lawns outside, plus a coffee and scoot along Honeysuckle. *Tyrannosaur comes from the Greek “tyrant lizard”. 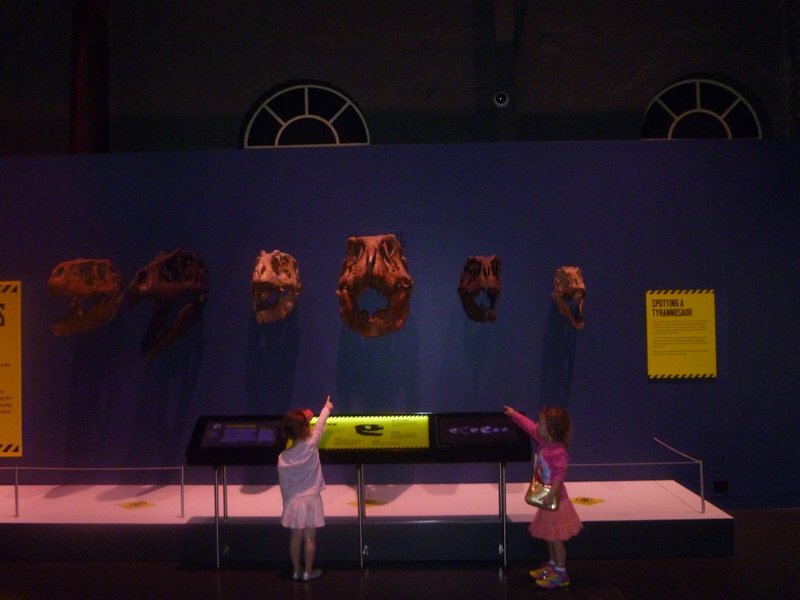 This entry was posted in Close to home and tagged Gualong wucaii, Honeysuckle, Mesozoic Extinction Event, meteorite, Mininova, Newcastle Museum, T.rex, tyrannosaurs, Tyrannosaurus rex on March 24, 2016 by Laura.